Because this is a World Cup year, I have decided to countdown to the tournament by providing a short soccer/fitness related preview of each of the 32 participating nations. In this installment, I will look at Germany, the European favorites who have been drawn in Group G, largely considered the “group of death”, which also includes Portugal, Ghana, and the United States. Germany plays their first match against Portugal on June 16th. Germany have won the World Cup 3 times (1954, 1974, and 1990). They have also finished second 4 times (1966, 1982, 1986, 2002), and finished third a further 4 times (1934, 1970, 2006, 2010). In the European championship, the Germans have been just as dominant, racking up 3 victories (1972, 1980, 1996), finishing twice as runners-up (1976, 1992), and finishing in 3rd place a further two times (1988, 2012). This pattern of success is unrivaled in the history of soccer, and for most fans, it is difficult to even remember a major tournament in which the Germans didn’t at least make it to the semi-finals (for those keeping score, it would be the 2004 European Championships in Portugal, where they failed to get out of their group and finished a disappointing 12th). The Germans score highly on all three of these criteria due to their large population (over 82 million), strong economy (at $3.5 trillion GDP, they are ranked 4th in the world behind only the United States, China, and Japan), and their wealth of soccer experience (including the aforementioned history of success at major international tournaments). Even the words directly under the title on the front page of Soccernomics read: “Are Destined to Become the Kings of the World’s Most Popular Sport”. Simply put, Germany is a country that has a lot of natural advantages that will allow them to be successful in all sports, including soccer. 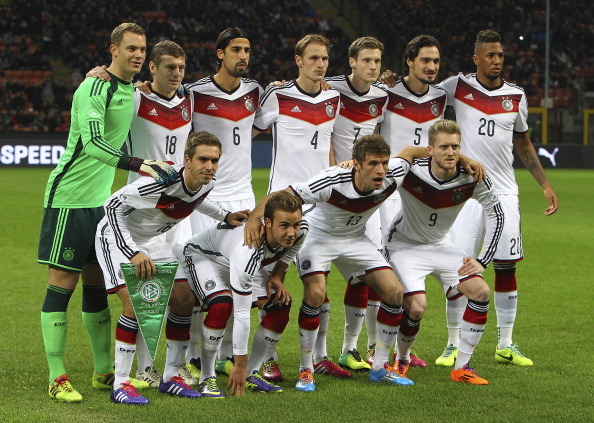 The 2014 German World Cup team could be one of their best ever. The roster features a unique mix of older veterans (35 year-old striker Miroslav Klose is poised to break Brazilian Ronaldo’s all-time World Cup goal scoring record of 15, by improving on his own total of 14); star players in the primes of their careers presently playing with top European clubs (Mesut Ozil of Arsenal, and Bastian Schweinsteiger, Thomas Mueller, and Phillip Lahm, all from Bayern Munich); as well as a plethora of young emerging talent (Marco Reus, Andre Schurrle, Toni Kroos and Mario Gotze). For the German team and their fans, anything short of a 4th World Cup victory will likely be viewed as a failure. Based on the principles of Soccernomics and their proven track record, Germany has all the tools to make it happen this year. We will have to wait and see what happens in 3 weeks’ time.